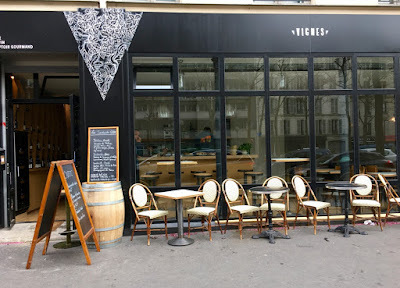 Vignes' opening party, before the terrace seating was installed. The great legacy of the cave-à-manger neologism has been to turn most new Paris wine shops into functional bars. 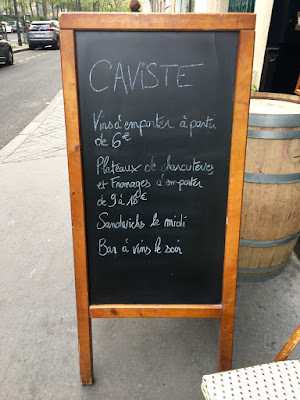 You'd have to be either insane or misanthropic to open a wine shop that merely sold wine in Paris these days. The same license permits wine retail and restaurant activities and the line between what constitutes a restaurant and what constitutes a bar (which designation requires a more expensive and regulated Licence IV) is in effect extremely blurry. As often as not, lack of a License IV redounds to a proprietor's benefit, because he or she retains the bulletproof excuse that the kitchen is closed whenever it becomes necessary to decline to serve the visibly drunk or deranged. Inspections are rare, so proprietors are under no obligation to apply the same standards to normal happy drinking humans. Wine shop becomes ostensible restaurant, actual bar, albeit one that tends to close by midnight. 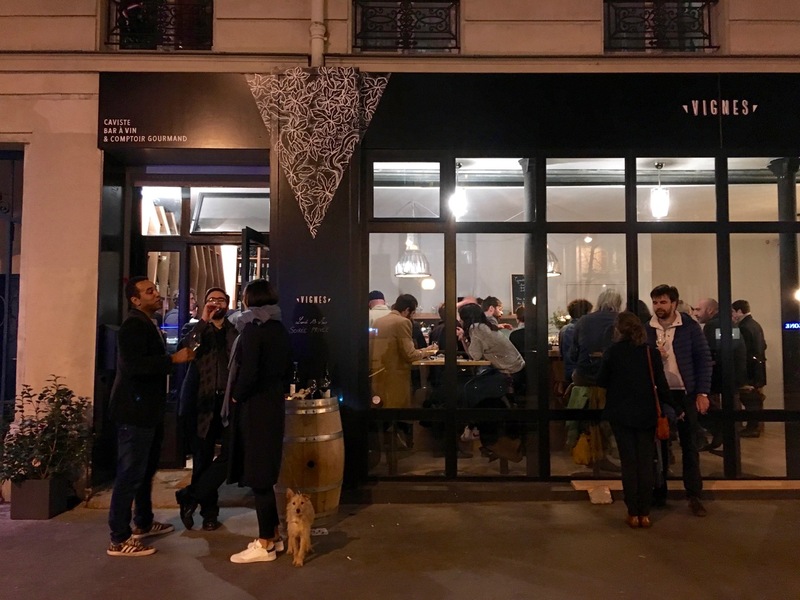 The latest to gainfully skate this line is the former manager of Thierry Bruneau's popular 12ème arrondissement wine bar Le Siffleur de Ballons, Frédéric Malpart, who opened his caviste - bar-à-vin Vignes in Belleville back in March. 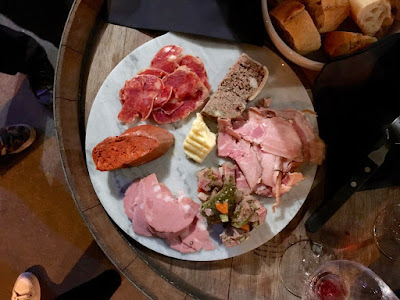 Like Malpart's former workplace, Vignes boasts a clean, blonde wooden décor, airy white lighting, kind staff bearing simple meat and cheese plates, and an open-minded selection of organic, biodynamic wines. Unlike Le Siffleur de Ballons, Vignes has a handful of spacious terrace tables, and gives out on the broad boulevard de la Villette. 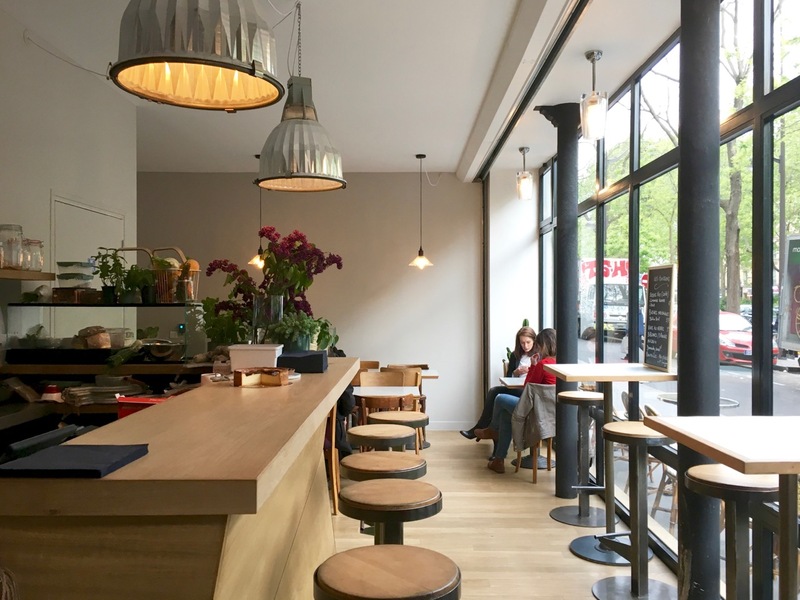 It is instantly the only terraced bar serving a natural wine selection in Belleville*, and a valuable addition to the neighborhood renaissance presently underway. Malpart is a genial and unhurried guy whose tastes split the difference between full-throttle natural and merely well-made wines. 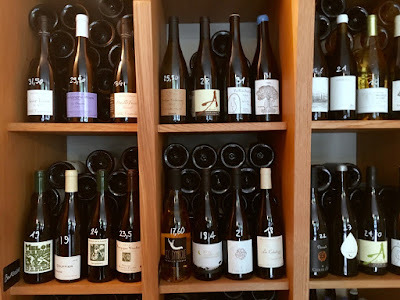 His selection at Vignes is less kitchen-sink than nearby La Cave de Belleville (where the wine selection has improved since opening), less ideological than his other closest neighbor, La Cave à Michel. 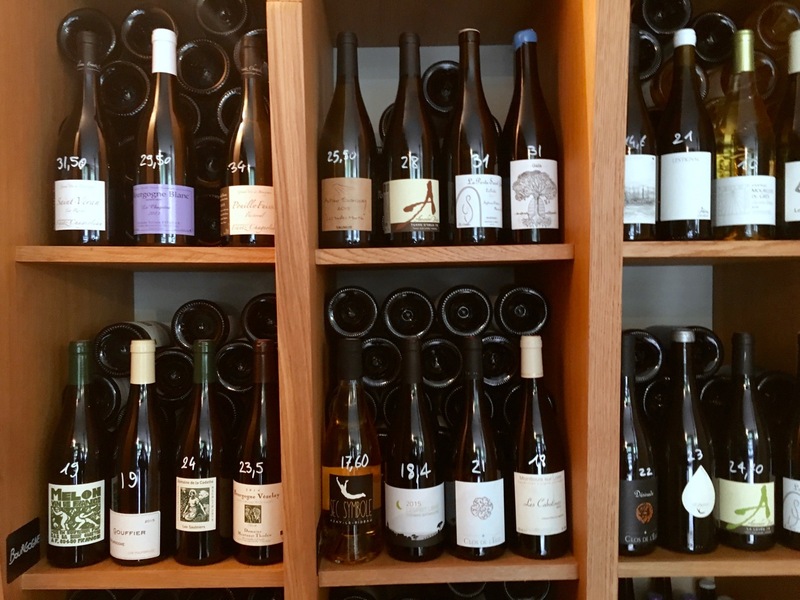 One isn't assured, by its very position on the shelf, that a wine is sulfur-free, but then, relying on that sort of assurance is just another way of avoiding thinking about natural wine. On a recent visit to Vignes my friend C introduced me to the wines of Saumur vigneron Sylvain Dittière, who formerly worked for Clos Rougeard, among others, and who now releases wines as La Porte Saint Jean. 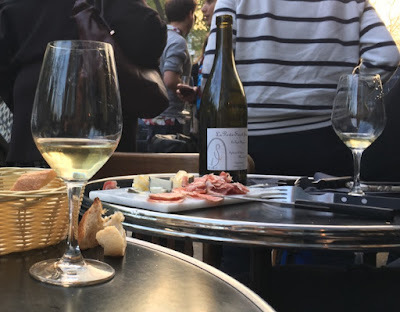 His 2015 "La Saut Mignon," from sauvignon, was a vivid, leesy expression of the grape's characteristic herbaceous qualities, supple and unfiltered. The wines' prices are a tad ambitious, though, and sit oddly next to the plebeian font Dittière has chosen for the labels. Also in fine form that night was Beaujolais vigneron Raphael Champier's bristling, buoyant 2016 Beaujolais-Villages "Les Lurons," from a flat, old-vine granite parcel between Saint-Etienne-des-Oullières and Odenas. 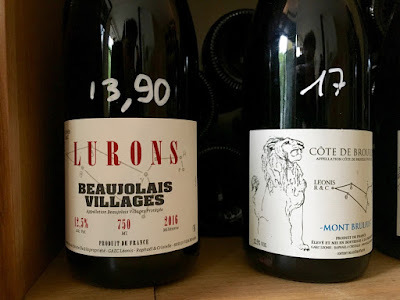 Almost everyone's 2016 Beaujolais is a joy to taste after the extractive 2015 vintage, but Champier and others on the Brouilly-BV border had none of the hail issues of their peers further north. The 2016 "Les Lurons" is a small-scale masterpiece, abundantly black-berried, light on its feet, a positive steal for the price. Vignes isn't reinventing the wheel, not with its format, nor with its slightly workaday charcuterie and cheese offerings. But, like a great glass of Beaujolais-Villages, it's doing a small thing very well, and deserves to remain in high demand. * I am discounting the otherwise marvelous La Fontaine de Belleville for being more of a café, and for closing quite early, and for being situated quite at the farthest limit of Belleville proper. ** I received a disproportionately spiteful scolding from a staff member at Septime Cave the other day after opening a cabinet to verify a bottle's vintage, something I had been doing routinely without incident there for the three years before that particular staff member's arrival. The outburst came as a shock, an abrupt breach in the Septime group's otherwise sterling hospitality standards. My friend and I paid and left, abandoning the bottle we'd been sharing until then. My 2016 post on Raphael Champier. A nice piece on Sylvain Dittière at Mi Fugue Mi Raisin.